Then please help us to get the word out to every MOBI, Muppet, Phasie, DENS and Mechanician you are in contact with. Congratulations, you've found our new website...! On the 3rd of November, 2003, two members of the 13th MOBI Intake realised a long held vision to create a unique website, with an on-line forum for ALL ex-Naval Artificer Apprentices, (MOBI's/ Muppets), Phasies, Mechanicians, Direct Entry Tradespeople, etc., along with all the Support Staff, Instructors, Officers, Ship's Company and 'Friends'. We would like to acknowledge the inspiration of a number of un-official RAN websites, including "The Gun Plot" and Warren Midgley, 14th MOBI Intake, the first to put together a website for a Nirimba Intake, our computer/ internet 'guru' Charles, and finally to those who wittingly or unwittingly contributed to some of the graphics on our site. We couldn't have done it without you...! This is a privately owned and operated un-official NAVY website, specifically designed to create an on-line forum catering to our community of ex- and serving personnel of the Royal Australian Navy. All logos and trademarks and trade names and photographs appearing on this site remain the property of their respective owners. 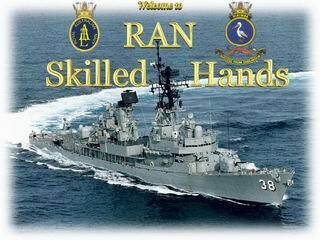 All else belongs to RAN Skilled Hands. Whilst RAN Skilled Hands Admin takes all due care it does not take any responsibility for the content of members posts. RAN Skilled Hands © 2003-05 All rights reserved.